Can you believe this is the first day of June? There are so many books we anticipate reading over the summer months, especially one in particular. This book makes our choice this week quite easy. We can't wait for Between by Jessica Warman. Why did we choose this title? If you read Where the Truth Lies (our review) or Breathless, those two titles should be enough proof. We would read anything by Warman, that's how much we admire and love her style of writing and crafting contemporary YA stories. Look at that cover too. The upside down grass, the girl's hair creepily covering her face, the swings. Here is the summary for Between: Elizabeth Valchar --- pretty, popular and rich --- wakes up the morning after her 18th birthday on the yacht where she’d been celebrating with her closest friends. A persistent thumping noise has roused her. When she goes to investigate, she finds her own drowned body is hitting the side of the boat. Liz is dead. She has no memory of what happened to her, and can only observe in horror the fallout of her death. Sounds great! 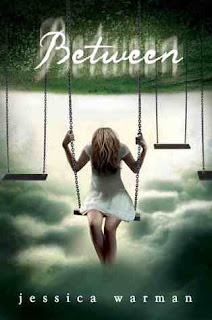 Between, hardcover, 464 pages, will be published by Walker Childrens on August 2nd. Two more months to go. What are you waiting on? This sounds incredible. Thanks for spotlighting it!